Looking for some inspiration on what to do in December in Switzerland? December is a month full of activities to get you and the family into the Christmas spirit. Here are our suggestions on where to explore and eat this December. You know it’s almost Christmas in Zug when you find a puppet show in a bank, Samichlaus reading stories on a boat and musical fairy tails have taken over a violin shop. It’s time for Märisunntig - or Fairytale Sunday, which takes place this year on the 9th December for the 35th time. The program of all the activities can be found online (stories are told in Swiss german). Stay till 17:30 for the Samichlaus parade and fireworks. 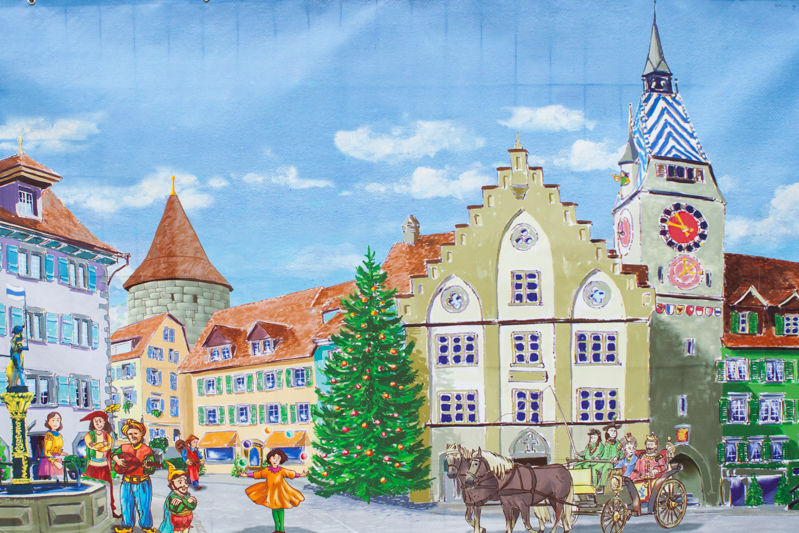 If you are looking to avoid the mainstream Christmas markets this year, why not travel into the region of Emmental near Bern to experience for regional handmade specialities at the Kambly Christmas Market. Kambly, the makers of famous Swiss cookies have their own “Kambly Experience” right next to the Christmas Market and check out the latern trail as well. Open 30th November - 2nd December as well as 7th thru 9th December. Candle dipping is one Swiss holiday tradition I have yet experience and I am determined to visit the candle dipping stand, inside the Music Pavilion on Zurich’s Bürkliplatz, to give it a go this holiday season. Open daily from 10am till 8pm until December 23rd you can dip wicks into bee’s wax to create your own unique masterpiece. Check out Tanya from Moms Tots Zurich for her in-depth review or visit the Zurich Candle Dipping website (german only). Not near Zurich, look for “kerzen ziehen” in your neck of the woods. Magical pop-up fondue chalets are the new black in Zürich during the festive season, but one that stands out and my personal favourite is Fräulein Holle. Inspired by the Brothers Grimm Fairytale “Frau Holle”, the chalet is located on Kalenderplatz at Sihlcity. Sitting at intimate tables of 4 or long more social benches enjoy a handful of fondue options as well as a daily changing lunchtime menu for those looking for a lighting option. The interior is stunning, with not only tables to enjoy your fondue but a smaller sitting area with sofas, a real fireplaces and books for all ages inviting you to order a warm drink and stay awhile - I wish this was my living room! A soothing escape form the hustle and bustle of the Christmas shoppers outside in the shopping center. As with all temporary fondue places all of Switzerland, I strongly recommend early booking as Fräulein Holle is a popular place for group meals over the festive period. The Fondue Chalet in Zug located at the home of the local ice hockey team EVZ is hugely popular and already almost completely booked for dinner up until Christmas. But lunchtime on Sundays are still free - so why not book a table to fill your tummies full of fondue before Märlisunntig. For a festive and tasty weekend come and enjoy a fondue at the Bains de Paquis, a Genevois institution set right on the lake. Many locals claim it’s the best fondue in town and the setting is gorgeous. After that if you still have room, head over to the Lauduree tea room which is a treat for the eyes as much as the stomach! Famous for it’s cheese and cream of course Gruyère has a fondue train! The old style retro train departs Bulle twice daily, once for lunch and once for dinner, and includes fondue and the traditional dessert of meringue and cream. For those who aren’t fans of Fondue, pre-order a meat platter instead. Bookings are essential, at least 2 days before departure.